I’ve always loved salads that were loaded with flavour, but in the past I considered loaded with flavour to mean loaded with creamy salad dressing (and maybe some cucumber chunks). I’ve since realized that most of that dressing is full of ingredients and chemicals that aren’t very good for me; so for the past few years I have switched over to making my own simple dressings, and have learned to look elsewhere for my flavour overload. 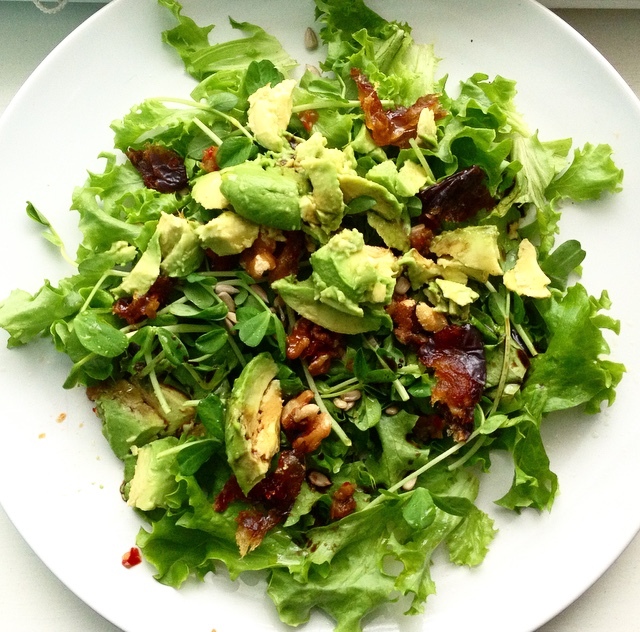 Now when I think of a loaded salad, I think of a salad that is loaded with flavourful and healthy toppings! My new favourite topping to add to my salads are medjool dates! They have a great sweet taste, and are good for your body. They are especially good when paired with something that is spicy! I’ve been using my fermented hot pepper relish, but you can also just chop up some jalapeno, banana peppers, or use horseradish!